Welcome to my website. Feel free to explore the information below as you please, and don't forget to contact me with any music or non-music related questions or comments. See the adjacent links for contact info, and please watch/listen to the featured tracks below. 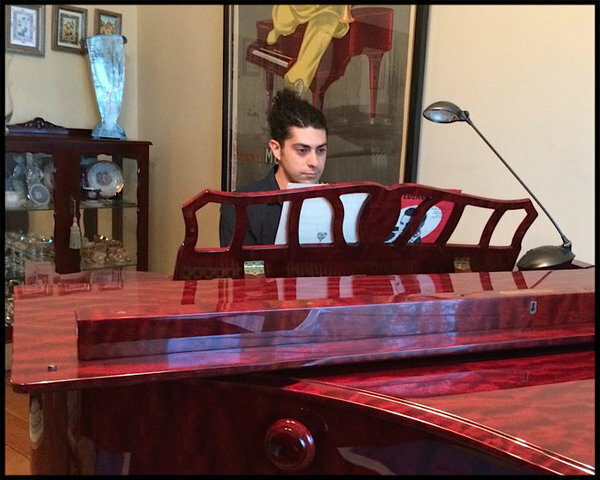 Learning classical piano from his early childhood years, Marco has been practicing, performing and composing ever since. In 2014 Marco completed a Masters of Music Performance at The University of Western Australia, with a full length program comprising of works by Chopin, Mozart, Busoni and Castiglioni. Part of Marco's studies involved a stint overseas studying in England and Italy, where Marco studied with several leading pianists such as Edoardo Strabbioli, Carlo Grante and Leslie Howard. In 2009, Marco completed his A.Mus.A. and has since completed a Graduate Diploma in Music at the University of Melbourne. Marco enjoys, and is adept at playing the piano in a variety of styles, especially rock, pop, blues and gospel. Marco’s aim as a teacher is to offer students the opportunity to enjoy a complete and rounded musical education. Currently teaching both in schools and privately, Marco has experience in teaching students young and old, beginners through to advanced, classical, improvisation, pop songs, and preparing students for exams and performances. From virtually the moment Marco began learning the piano, he began improvising which led to creating compositions of his own. Marco has written dozens of songs for rock bands, pieces for small ensembles, as well as co-writing a soundtrack to a short film. The final of the 24 Chopin Preludes. I have uploaded my recording of the entire set onto youtube. A quartet I composed for Clarinet, Trumpet, Euphonium and Piano.